Photographer Keith Ellenbogen, a regular Aquarium blog contributor, is on the expedition capturing stunning underwater photos of marine life as well as the essence of life on a working research vessel. 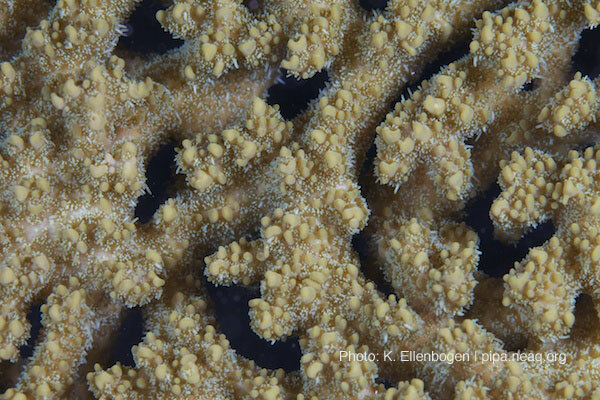 Here are some of the beautiful corals he photographed around the Phoenix Islands. Corals are animals that build a calcarous skeleton and harbor plant-like photosynthetic symbionts within their tissue. This fabulous trio of animal-mineral-vegetable often looks like a rock, a pillar, or a table formation... but it you look up close, you will be able to see the beautiful textures, patterns, and colors that are formed. 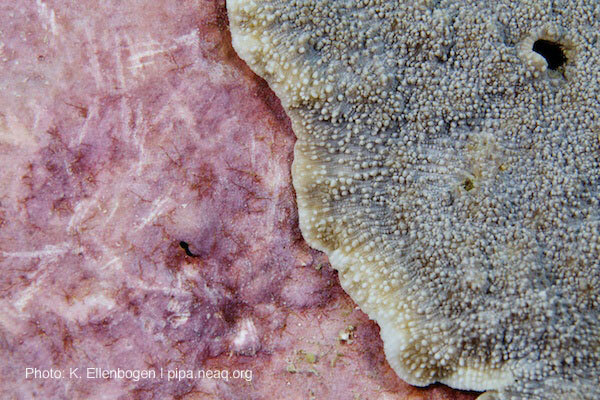 During the daytime, polyps are retracted (you can see the white-ish tentacles hiding in the grooves). 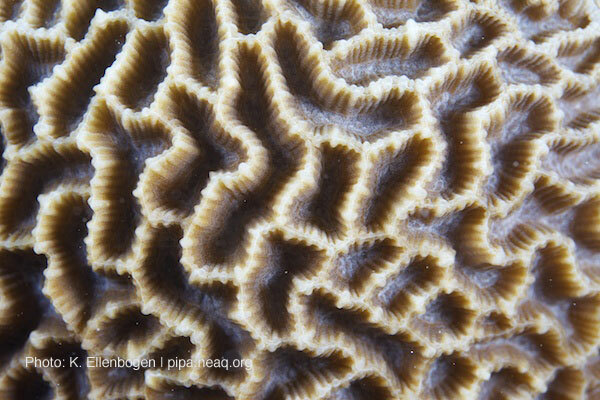 The protruding ridges are the hard coral skeletonc overed by a think layer of coral tissue, sheltering the polyp mouths in the grooves/valleys. Corals are in the class Anthozoa, which literally translates to "flower animal". Though the polyps are again retracted here, you can begin to see why: the floral-like patterns of this coral (Hydnophora rigida), and imagine what it will look like with polyps extending to feed with their anemone-like tentacles. The green centers here are bursting with GFP (green fluorescent protein), which is very commonly observed in corals. These green areas are where the polyps will extend at night - if you look closely, you can see the small mouths of retracted polyps. 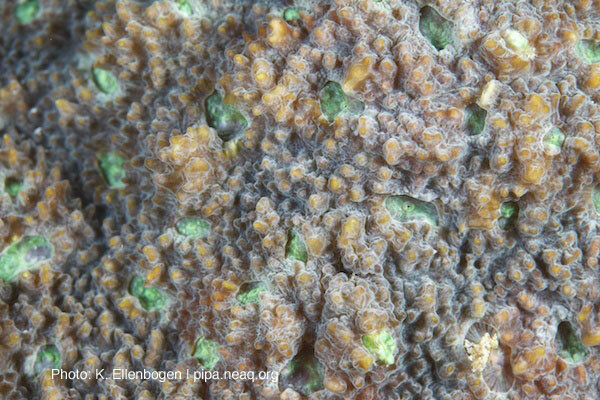 Crustose coralline algae (CCA) is a beautiful, pink, cement-like algae that provides important substrate for coral growth. You can see the coral (on the right) slowly overgrowing the CCA on the left. The growth margins of the coral are light whitish/brown because the skeletal color is not yet overtaken by the color of symbiont-laden tissue... coral symbionts provide much of the brown-ish color displayed by corals. Fungids are fabulous! As you can tell from the photos above, there is a wide variety of coral patterns and structures. 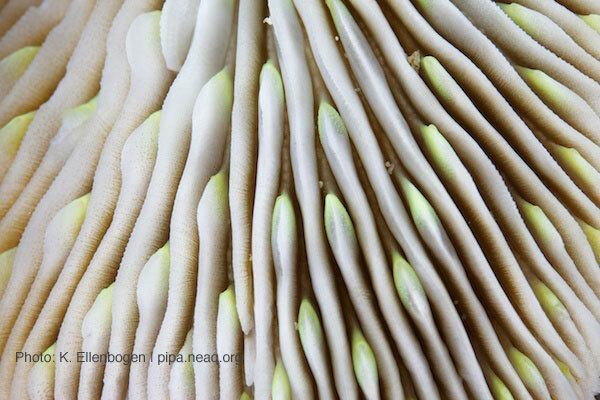 Fungids (like the one shown here) have layered ridges, often sporting only one (or sometimes a few) polyps amidst all that structure. Looking almost like sand-dunes from above, there is actual remarkable detail in the ridge structure that distinguishes one species from another.